Eric Waters was born and raised outside of Syracuse, New York. He attended Dartmouth College in Hanover, New Hampshire, where he met both his wife and his Lord. Michelle witnessed to him by telling the story of what Jesus was doing in her life. By the time he graduated in June of 1995, Eric wanted to believe in Jesus, but knew he didn’t. After graduation, Eric, a Russian major, worked for three months as a forest ranger in Siberia. He brought the Bible and asked God to speak to him. One day in October of 1995, God did. The Holy Spirit brought him to faith in Jesus that day, and Eric knew then that he would give the rest of his life to him. Eric and Michelle were engaged not long after he came back to America. He was confirmed on Pentecost of 1996, with Michelle sponsoring. They were married in December of that year and studied at Yale Divinity School in New Haven, Connecticut, where they both received their Masters of Divinity degrees in 1999. They served as intern pastors in Pelican Rapids, Minnesota and were ordained in July of 2001. 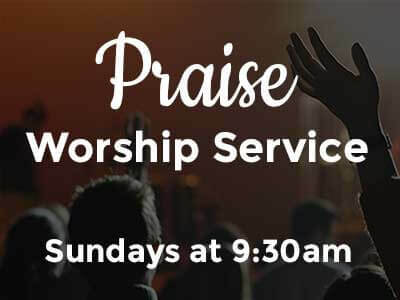 Eric and Michelle were both called as assistant pastors to First Lutheran Church in Fargo, North Dakota. Michelle stepped back from the ministry after the birth of their fourth child. Eric received his Doctorate of Ministry in Biblical Preaching from Luther Seminary in St. Paul, Minnesota in 2008. That same year, he began serving at Upper Arlington Lutheran Church in Columbus, Ohio. 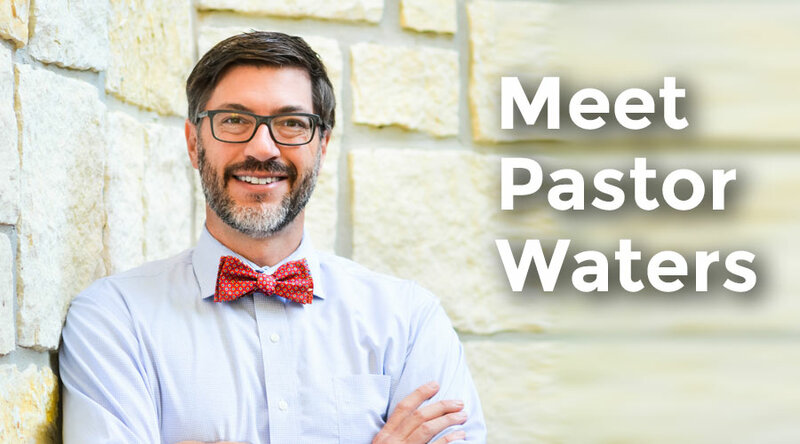 In 2016, Pastor Waters was called to serve at St. John Lutheran Church in Boerne. Eric and Michelle have been blessed with six children: Sophia (17), Elizabeth (15), Samuel (13), David (11), Jonathan (9), and Matthew (6). They are very excited about the Lord’s call to serve as the Senior Pastor of St. John, and eagerly looking forward to finding where the Lord will take this church in the next few years. Mariola Bergquist has been serving at St. John Lutheran Church in Boerne since September 2001. She was born in Poland and attended the University of Cracow, graduating with a degree in education and Polish literature. Mariola went on to study theology at the Christian Theological Academy in Warsaw, Poland while working at the Polish office of the World Council of Churches. She earned her Master of Divinity degree and was given a grant from the Lutheran World Federation and American Lutheran Church of Women (ALCW) to continue her theological studies at Wartburg Seminary in Dubuque, Iowa. There, she received a Master of Sacred Theology (STM) degree in New Testament Studies. She married her husband, George Bergquist, of San Antonio Texas and moved to Austin where she completed an internship at St. John Lutheran Church in Austin. Mariola was ordained in the ELCA on December 16, 1990 by Bishop Henry Schulte and installed as a pastor of a dual parish in Taylor, Texas. She served in Taylor from 1990-1995 before moving to a church in Adkins, Texas. Her daughter Anna Marie was born in 1997. In 1999, the family moved to Boerne. 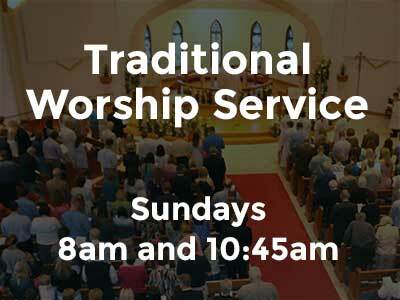 Pastor Mariola currently serves St. John Lutheran Church as the Associate Pastor. Pastor Henry Schulte served as Pastor of St. John Lutheran Church in Boerne, Texas from September of 1994 until June of 2015. College and Trinity Lutheran Seminary in Columbus Ohio where he was ordained as a minister in 1965. He has served at churches in Shelby, Texas, Fayetteville Texas, San Antonio and Kerrville, as well as serving on the ALC (American Lutheran Church) Board for many years. In 1990, he was elected Bishop of the Southwestern Texas Synod of The Evangelical Church in America. Pastor Schulte served as Bishop until he was called by St. John Lutheran Church in Boerne in 1994. When he retired from St. John in 2015, Pastor Schulte had 50 years of ordained ministry to speak of. In his 21 years of service at St. John, Pastor Schulte was responsible for two huge accomplishments: the growth of the St. John congregation and the physical building that we all know as St. John Lutheran Church. When he began his ministry at St. John, the congregation worshipped in the Historic Chapel on Rosewood Avenue and Turner Street. In the late 1990s, the growth in the population of Boerne spurred the growth of St. John’s congregation. The Historic Chapel was no longer an adequate space for all the members. 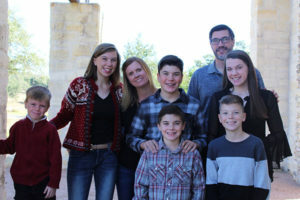 Pastor Schulte began the huge undertaking of raising money and beginning construction of a new building which is now the current home of the Sanctuary, the Family Life Center and the Administration wing. He oversaw the entire process from working with the architects to supervising the construction. By 2014, yet another addition was built to house the Education rooms needed to serve the congregation’s Sunday School classes. Pastor Schulte was always very active in the Boerne community. He was involved with the Menger Retirement development, the Geneva School development, the Walk to Emmaus program, he served as the Chairman of the Ministerial Alliance, was on the Board for the Job Corps and could be seen at all the Boerne High School football games as one of their biggest fans! 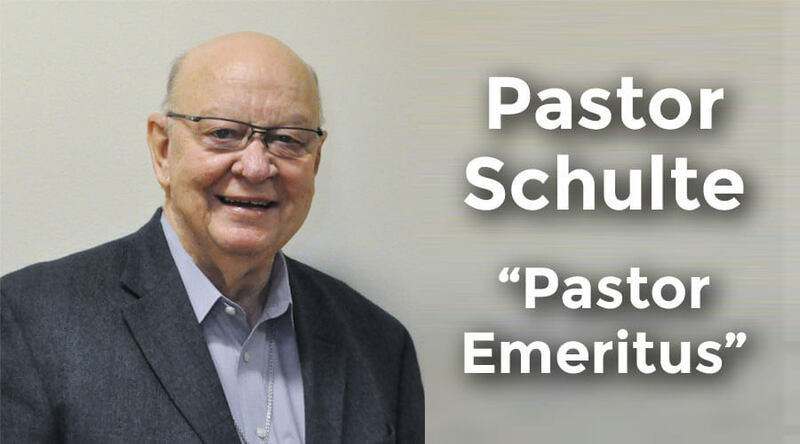 Pastor Schulte was honored with the “Pastor Emeritus” status at the Worship Services on July 15th, 2018.